Scene Point Blank is proud to team up with Radon to share their latest record, More of Their Lies. The album was released on CD earlier this year (Eager Beaver Records) and was just issued on cassette as well, courtesy of Dirt Cult, Tiger Force Ultra, and Rubber Factory. While Radon originally formed in 1991, More of Their Lies is their first album released on tape. It will also be available on vinyl later this year (Dead Broke/Creep). SPB is pleased to have some copies to give away for free. The follow the link in the last sentence, or click on our “COMPETITIONS” tab at the top of this page. Fans can also order the CD or get the tape online from Radon or Green Noise Records. 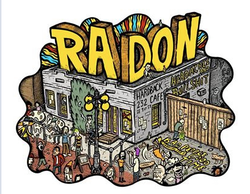 Radon will play Fest 17 on Oct. 28 in Gainesville, FL. They hope to have a limited supply of test pressing of the record on-hand. The competition will remain open until Oct. 1.